Every year, large companies update their computer equipment with newer and faster models to keep up to date with ever-increasing speed and power requirements. However, the out-dated equipment is generally still in good working condition with a considerable lifespan remaining. One such large company is SAMSKIP, a global logistics company with over 1,400 employees all over the world. They offered to donate a substantial number of used computers and other computer equipment to Aurora for an IT project in Sierra Leone. Ownership of personal computers is rare in Sierra Leone. Access to computers in general, even for those attending colleges and universities, is limited with very few opportunities for young people to improve their IT skills. Aurora – in partnership with SAMSKIP and a Sierra Leonean IT company Idt labs – decided to conduct a free ICT training course aimed at young people. Two employees of SAMSKIP prepared the equipment and participated in the course. Idt labs provided the venue for the course, the main teachers and also facilitated all the application procedures. 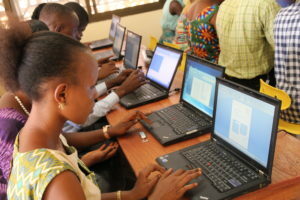 The reward for those who completed the training was a computer and a certificate, although the students were not informed about the computer donation until the time of the graduation ceremony. Over 300 persons applied to participate in the project. The 85 successful applicants sat through a five-day training course, where they received training in Microsoft applications and use of the Internet. Students ranged from 18–40 in age, with equal numbers of male and female participants. While the majority of the participants were university students there were also several entrepreneurs. The course was extremely well received with many viewing the training as a great opportunity to improve their IT skills. For others it offered an introduction into the world of information technology. As a pilot project implemented by Aurora, it really exceeded all expectations. It is Aurora’s hope that there will be other opportunities in the future to conduct similar courses. Hopefully, other companies will be inspired to get on board, as there are many more young people eager to participate.